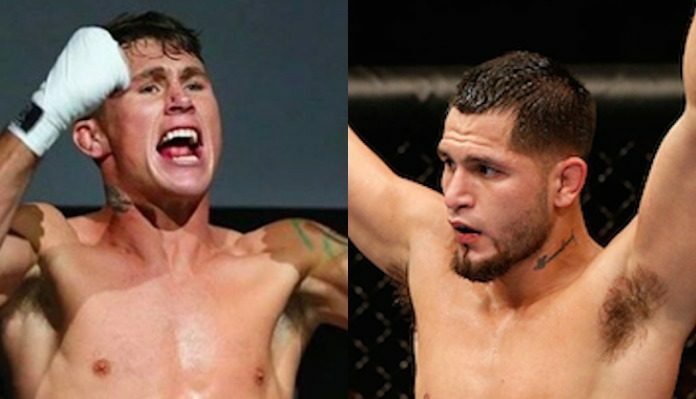 Earlier this week, UFC welterweight stars Darren Till and Jorge Masvidal seemed to agree to a fight in London on March 16. According to UFC President Dana White, who spoke to ESPN’s Brett Okamoto, this fight is now official for the UFC London main event. Jorge Masvidal has not fought since November of 2017, when he came up short to two-time welterweight title challenger Stephen “Wonderboy” Thompson. In his next most recent fight, he was defeated by another recent welterweight title challenger in Demian Maia. The fan favorite welterweight contender was briefly linked to a UFC 235 showdown with Nick Diaz, but reports of this fight were later proven to be inaccurate. Since his last fight, Masvidal has been busy with a reality television stint. Since the show ended, however, he’s been eager to get back into the cage. Darren Till last fought in September, when he came up short in a title fight with reigning UFC welterweight champion Tyron Woodley. In his next most recent fight, he picked up a razor-close decision win against Wonderboy, which went down in Liverpool. The UFC London bill will also feature a light heavyweight contender bout between Volkan Oezdemir and Dominick Reyes, first reported right here on BJPenn.com. That fight is tentatively expected to serve as the card’s co-main event. The card will also feature another light heavyweight fight between Gokhan Saki and Saparbek Safarov. The card will air on on ESPN+. Who do you think will come out on top when Jorge Masvidal and Darren Till collide in London?